Today, I'll let the picture and the words communicate with you. These pictures and words, they compliment each other. So, read both. It’s up to you how you’re gonna use this chance, cuz I ain’t giving you second chance. Uh-uh. All I know is you better use this chance wisely. Nothing is not fragile in this world. I don’t understand how some people are just... disappointing. How it’s easier for them to keep things up inside instead of confronting and tell the people concerned what is it that are messing around their minds and hearts. Well, I know it’s easier said than done. But this is YOUR life! You are the captain of your life. You know where you’re heading, you must know who is worthy for you to take along with your journey and you must know your ship very well if you wanna go to far away places. Places that people can’t reach by walking. You are what you think. If you keep thinking negative thoughts, thinking about the problems you had, then more bad things and problems will come! Irony nye. I should be saying this to myself. But everytime when I’m about to think something like that, I’ll remember what a dear friend of mine told me, ‘Nina, remember we told you about ______ thing? Jangannn’ and immediately I wash away the negative thoughts and tell myself, ‘If anybody has an issue with me, or I did something that hurt them, but they never tell me what I did wrong, or what did I do to make them feel hurt, them I’m just going to assume I DID NOTHING WRONG'. You were the one who’s hurt, and you know you can either hurt yourself more by keeping things to yourself (which I still remember another dear friend of mine told me not to keep things inside cuz it'll eat you up) and I’ll continue living my life, or you can confront me and I can apologize for any of my wrong doings, we can sort things out and let’s not jeopardize our FRIENDSHIP. Choice is in your hands. Ah. Suddenly I remembered when I cried the moment I understood something that my friend taught me in Chemistry just days before the SPM examination. haha Yes, I cried people. Why is it that men can be soooo vain sometimes? Cepat sangat perasan org suka dia. Pada hal, derrr, KAWAN je. Maybe some people would say they prefer to have guy friends, sometimes it just made me feel like I prefer to have girl friends. Or nobody at all. Why is it that people tell others their secrets? It's not a secret anymore if you tell other people. Derr. Maybe this is just the way I look things, it could be different from how you see it (obviously), but it seems that people nowadays tend to give away (or you'd call it sharing) secrets with each other, like ticket passes to enter a concert. Figuratively, the ticket passes = secrets. The concert = getting/ being close to friends. Or maybe it's like exchanging tickets. They exchange secrets. Are people nowadays so desperate to have friends that they have to exchange secrets? To me, if you tell a secret just to be with someone, or just to get close with someone, I don't think that's a sincere and honest way to start a friendship. That's merely my thoughts on secrets and friends. 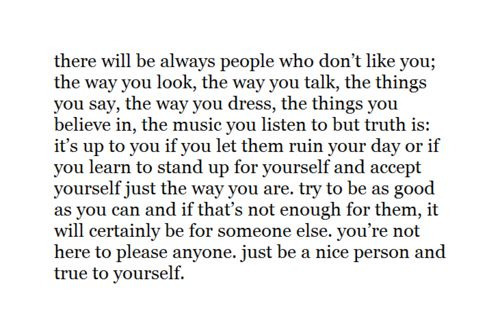 I'm not here to please anyone. I wanna know, what do you think about the things I said? Are we on the same par? Or you can't see it the way I do? Aku tak kisah ada org nak like atau tak, for me, I'm just spilling my thoughts and the truth about it. ahhh~ why is your blog so motivatinggggg?? ?